« Pro Line Eggfood: even better than before! Protein qualiy is very important in all eggfoods and softfoods of Joels. Why? Because it is essential for an excellent quality of your birds! Proteins are the building blocks of our body. They are essential for a well-functioning body. Proteins have an important role in many processes, such as muscle growth, plumage, immune system, oxygen transport and many more. No wonder that we want to offer a protein-rich diet to our birds! But the quality of this protein might be even more important that the quantity that we provide them. Proteins consist of amino acids. There are 29 different amino acids that combine to a countless number of different proteins. An amino acids can be converted into another one by the body. However, 10 of these are essential: the birds cannot make them and is completely dependent on its food. When such an essential amino acid is needed for a protein but lacking, the protein cannot be made. As a result, body processes, such as excellent growth, can ben impeded. The two amino acids where a deficiency arises first are lysine and methionine. When a shortage of these substances occurs, the process for which it is needed stops. This can, for example, impair growth in young birds. This is why extra lysine and methione is added to all eggfoods and softfoods from Joels. Each ingredient has a different protein level and a different composition of amino acids. This amino acid pattern can therefore fit better or less well to the protein requirement of our birds. A more favourable pattern results in a better usability of the protein and thus a better protein quality for our birds. If a bird gets too much protein through its diet that has an unfavorable amino acid pattern and is therefore lower in quality, then the bird body is not only deprived of certain amino acids, but also unnecessarily burdened. Non-usable proteins are partly stored, but also partly broken down and secreted again, in which the kidneys play a major role. This means that not only the percentage of protein in the diet of your birds is important, but the quality. A good protein must therefore not only be easily digestible and high in protein, but also contain a good quality proteins. Pro Line therefore uses a combination of vegetable and animal proteins, which together meet the demand for essential amino acids as good as possible. These are essential for the development and maintenance of the bird’s body and are therefore indispensable for a successful breeding and an excellent quality of young birds. 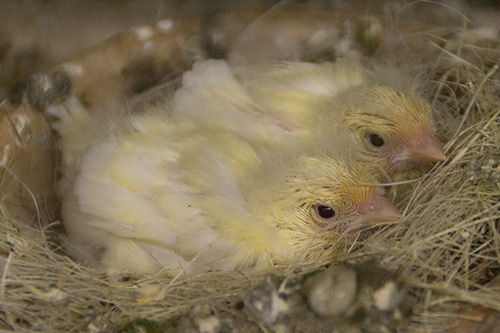 Some birds need some extra support, for example because they are recovering, peak in growth or have a plumage that requires extra maintenance. Then it can be useful to support your birds with a supplement. For instance, Pro Line Amino-B has is developed especially for birds that benefit from extra amino acids. This makes it possible to provide the best nutrition for specific birds in specific life stages or situations.